Drug Emporium was a retail drug store started in Columbus Ohio in 1977. At the company’s best they had over 300 stores nationwide. Due to failure to compete with drug stores such as Walgreens and CVS, Drug Emporium declared bankruptcy in 2001 as a term of its Sale to Snyder Drugs. 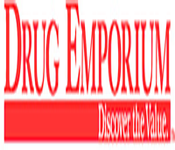 Although some stores still have the name Drug Emporium they are not affiliated with the Ohio based company.